In the roughly two years since I first made the Rocket Espresso Cup available on Shapeways, I’ve wanted to return to the medium of 3D printed ceramic. I love the idea of creating truly functional objects. And while I’ve experimented quite happily with metal jewelry, rabbi-approved nylon yarmulkes, and spherical Islamic star patterns, there’s something special about functional objects for the kitchen, and the gloss of 3D printed ceramic. It’s a fussy medium: the geometry can’t be very complicated or too fine, and so the object has to communicate its design and function without too many bells and whistles. The opportunity presented itself one evening as I observed my kids engaging in their post-dinner ritual of biscuits dipped in milk. The glasses that are large enough to accommodate a whole biscuit require them to drink a lot of milk, more than is needed for dessert. On the other hand, a reasonably sized glass isn’t wide enough to dip a biscuit, at least without breaking it. 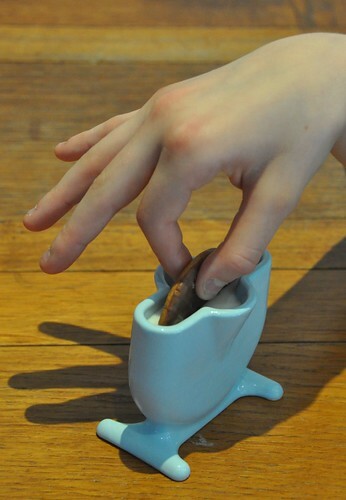 I started to think about a slot-shaped cup that was just large enough for dipping. It didn’t take long to come up with the design below, including flared sides where your fingers can slide in while dipping. 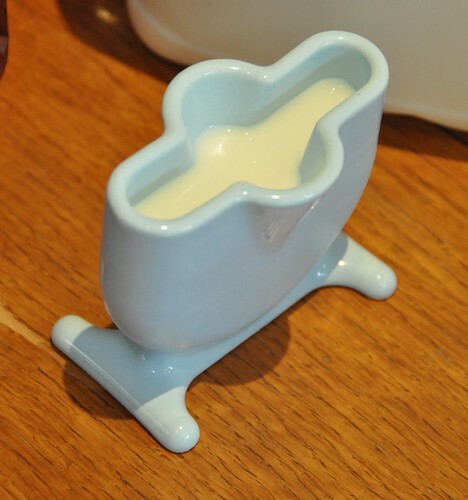 The cup holds only 100 mL of liquid, and you really only want to pour in about 75 mL of milk to avoid overflows while dipping. I started out developing the 3D model in my software of choice, Rhinoceros. Unfortunately, I quickly hit a brick wall. Ceramic printing works best when all your edges are rounded off (filleted, in the language of 3D modelling). 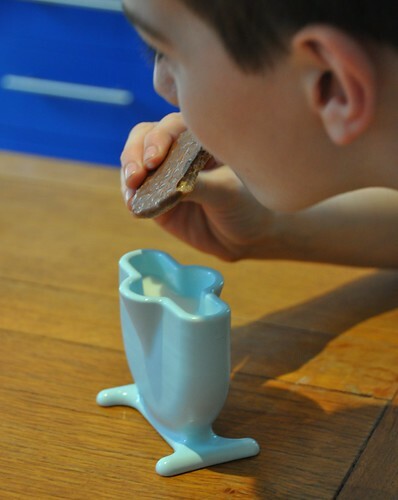 But Rhino kept choking on any attempt to fillet the sharp-edged form that precedes the final cup design. The problem seems to stem from the combination of filleting and boolean operations on solid objects (which are essential to the design). Searching around online for an alternative, I stumbled upon Inventor Fusion, a free technology demo offered by Autodesk. It took a while to become accustomed to the peculiar user interface (not Blender peculiar, but still a bit counterintuitive in places), and the documentation is somewhat scarce, but once I figured out how to express what I wanted I saw that this tool handled booleans and filleting like a champ, and I was good to go. Alas, it seems as if Autodesk might not be continuing development of Inventor Fusion, so it’s unclear where I’ll turn for my next project. I’m contemplating abandoning WYSIWYG 3D modelling software entirely, and expressing models as code using a library like Open CASCADE. After all, I write all my scholarly papers using a programming language rather than a visual editor; why shouldn’t I create my 3D models the same way? As soon as the 3D printed cup arrived from Shapeways, I knew I had to test it immediately. I sent Z off to the local convenience store to pick up the Platonic Ideal of store-bought biscuits, the McVitie’s chocolate digestive (though I’m quite partial to their caramel digestives). The kids were all too happy to eat a couple of biscuits in the name of Science, and definitely approved of the result. If you’re interested in owning a Little Dipper of your very own, you can order one from Shapeways. One Response to "The Little Dipper"